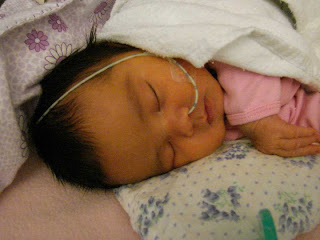 Patty at MorningRamble has made the following request that we all say a prayer for her little granddaughter, Mei-Ling. This morning I was thinking about the 1,100 + hits my blog had yesterday. Imagine the amount of prayers that would be going up for Mei-Lings complete healing if every single blogger that read my blog would post a prayer request on their blog, with a picture of the baby and asked every one of their readers to pray for the baby and to add her to any and all prayer lists they know of and add this request to their blog too. Amazing amounts of people all over the world would be praying, thinking good thoughts, etc for little Mei-Ling. If you would do this, feel free to copy and paste a picture of her from my blog and put it on your blog. Let me know too, if you have added this to your blog, I would love for Melanie and Casi to see it. There is so much power in prayer and belief." Dear Father, I add my prayers to those of everyone else that you heal little Mei-Ling and let her go home to her loving parents. And I pray that you wrap Melanie and Casi in the healing power of your love as they suffer the anxiety of wanting their baby to be healthy and at home with them and the worry about the enormous financial burden that has been placed upon their shoulders. And I pray for Patty and Emery that you ease the hurt they feel as they watch their darling little granddaughter struggle to adapt to this new world. And I also pray for Casi's family as this must surely too be weighing heavily on their hearts. Dear Lord, I ask that you please just bring peace to this family that has had such a difficult time these past few months. These things I pray in Jesus' name. Amen. I'm keeping them in my thoughts and prayers, Nancy! I'm 58, married for 39 years to my wonderful DH, David, with 2 fur kids, 1 canine and 1 feline. I enjoy quilting, gardening, cooking and photography.